New 2011 Copic Products-Part 4, Prize Winners & A New Color Chart! Congrats to the winners from Friday's blog post giveaway -- here are the three winners chosen from my blog for the new 2011 Copic Color Swatch Book. I was laughing hysterically at some of your comments! 1. colourful joy in a 6 inch marker! 2. tool which aids in "colouring for big kids"; a de-stressing tool . Oh well... so much for my New Year's resolutions - "Cull Crafting Cache". Seriously, with CHA around the corner? What was I thinking?!!? LOL! I've used the white for some time since I have to have it all of coarse. Congratulations, ladies! Please email me with your mailing address and Copic will send your new 2011 Copic Color Swatch Book to you! For the rest of you -- thanks so much for leaving comments for the chance to win. If you didn't win, you'll be able to find these new 2011 Swatchbooks at your local Copic retailer soon. 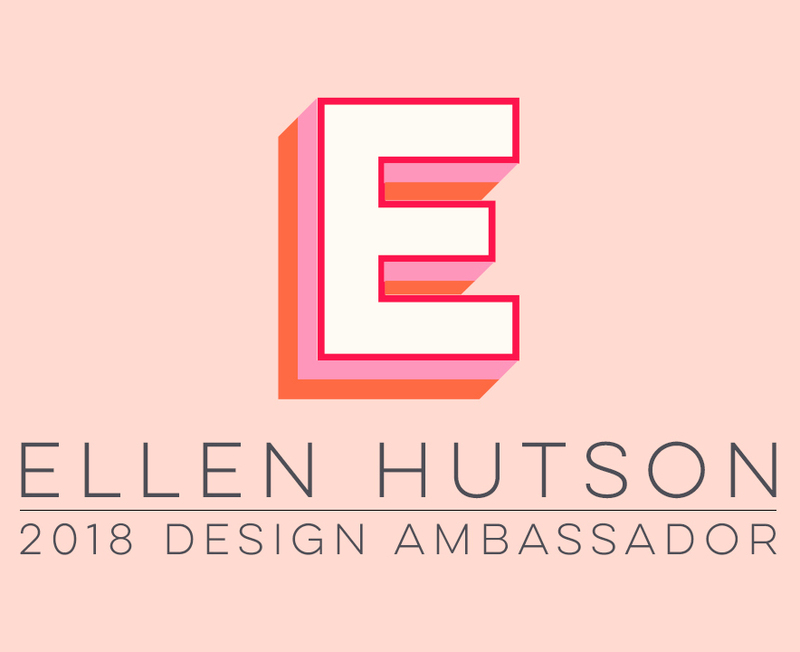 If you just can't wait for the new ones, I know Ellen Hutson has the 2010 Swatchbooks still in stock, HERE, and you can simply write in the new 2011 Sketch colors as you get them later this year! Today we have one more new product to share, and I think you'll all agree, this one is very exciting! 12 New Copic Sketch Marker Colors! Remember to print the chart on your favorite Copic-compatible cardstock you normally use for Copic coloring, for the truest representation of color. I've printed mine on X-Press It Blending Card with no problem -- I chose a brochure paper printing option on my HP all-in-one printer. For future reference, you'll also be able to find the above chart on the Copic Info Page of my blog. Enjoy! We hope you are as excited about all of these new products as we are -- Be watching for the products to appear at your local Copic retailer over the next few months! Here's that project I promised you yesterday, colored with Copic markers on Copic's new X-Press It Blending Card -- look at how vibrant the colors are! This card is for JustRite's Friday Challenge #030, using an inspiration photo as inspiration for your project. You can find all the details about this week's challenge over at the JustRite Inspiration blog. The white paper doilies were airbrushed with the E50 marker, so they would match the ivory cardstock base I used. The Copic X-Press It Blending Card is currently available for retailers to order through your normal Copic distributor. If your favorite retailer isn't aware of it yet, let them know about it! Above was the entire Copic team at dinner one night -- we were all there except for sweet Canadian Sherrie Siemens! From left to right: Justin Cooper, Marianne Walker, Debbie Olson, Jennie Black, Colleen Schaan, Jenn Balcer, Lori Craig, Ron Sprafkin (National Sales Mgr), Jonny Felbel (the Australian Copic distributor), Nancy Zenke (Certification Coordinator) and me. Here is the team that helped at Copic's make & take at the Splitcoaststampers booth at the consumer SuperShow Friday morning. 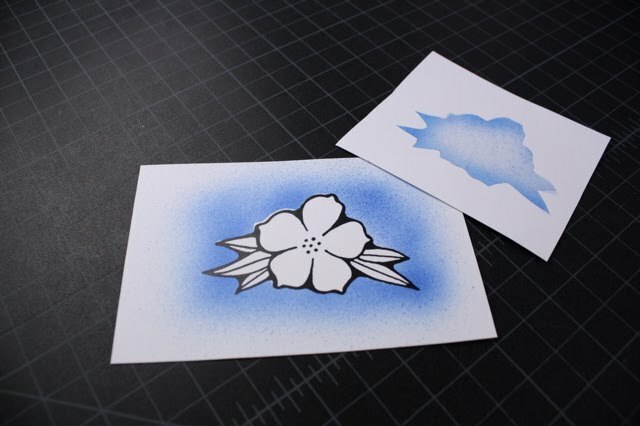 Lori was also working Splitcoaststamper's portion of the make & take in the same area, using Copic markers. Here's Marianne and I teaching this cute snowflake envelope make & take project that Lori designed! It used the new X-Press It Double-Sided High Tack adhesive tape and Copic Spica Glitter Pen. It was so much fun to talk with 100+ people who came to do the make & take! And here I was, demonstrating JustRite stamps and Copic markers at the JustRite Stampers booth! Hope you have a wonderful weekend ... thanks so much for stopping by! New Copic X-Press It Products! This has us very excited! Marianne Walker mentioned a couple months ago that she recommend this paper to anyone living in Australia (because they can’t get Neenah over there), and now it's coming to the United States! Why did we fall in love with this paper? Because it blends beautifully, it bleeds less than our old favorite, Neenah Classic Crest, and it has a nice, bright white color. If you have ever tried Bazzil Simply Smooth paper, the Blending Card is like a hybrid between Neenah and Bazzil. This paper is now available for retailers to purchase through your usual Copic North American (and Australian!) distributors. It comes in a large pack with 125 sheets of letter sized paper. It is about 92 lb. paper -- just a little heavier than the Neenah, but it is a much tighter grained paper, so it doesn't feel too thick. 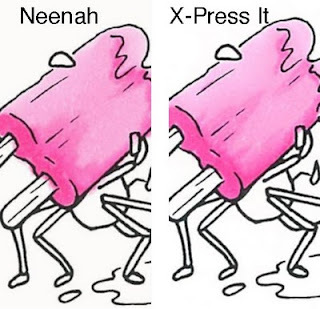 If you look at this close up on the pink popsicle, you can see that the Neenah is a much softer paper, and it can feather if you don't let it dry a little between layering colors and/or color too closely to the stamped lines. This gets to be a big problem when you're working with intense reds and other dark colors. The Blending Card, however, gives nice blends without bleeding and you don't have to wait or be careful! I love it! 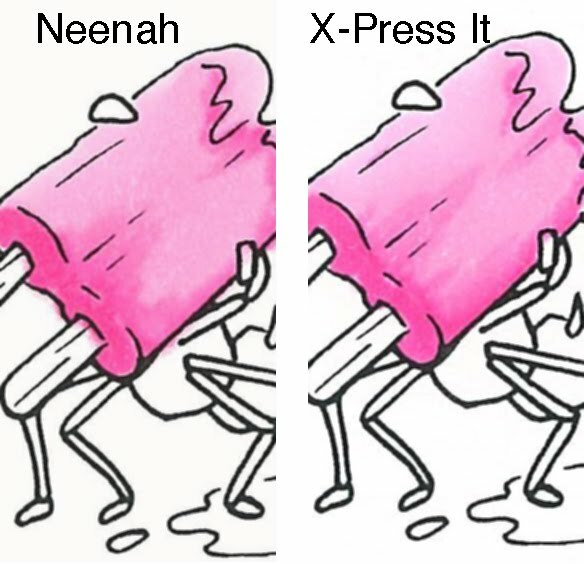 Because it is not as soft as the Neenah, it takes less ink to color so your marker lasts longer before needing to be refilled. Here is a video from CHA of Marianne Walker talking about the new blending card on YouTube. You can view it here. Everyone who stopped by the CHA booth and tried the blending card absolutely LOVED it! You'll love it too, so be sure to check it out soon at your local paper crafting store. 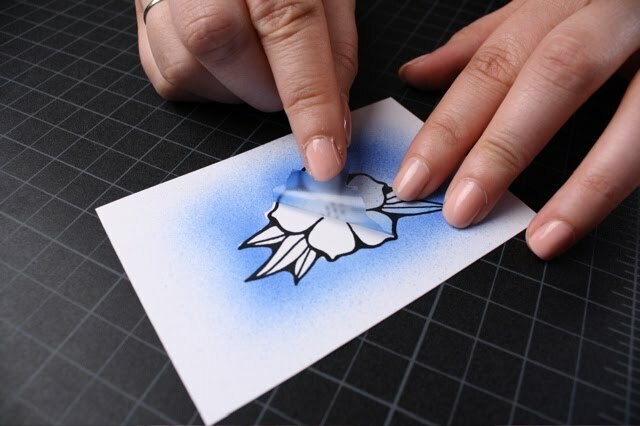 Copic design team member, Sherrie Siemens, just posted an awesome video of her coloring on the new Blending Card and using the new masking film (detailed below). You can find that HERE. This tape is extremely high tack, acid free, easy to use, and comes in 3 sizes: 1/8", 1/4", and 1/2". Originally developed for the picture framing industry in Australia, this tape is perfect for paper crafting. Rolls are very inexpensive, and there's a lot of tape on each roll as well -- 55 yards on rolls of 1/2" and 1/4", 27 yards on the 1/8" rolls. 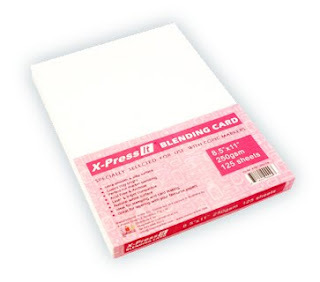 X-Press It Tape is heat resistant (you can heat-emboss with it) and very strong. Members of our design team have used it for hemming their pants and it will survive the washer and dryer! High Tack tape is easy to use. It tears cleanly with your fingers and the liner/backing is easy to peel off. I really like this! The next new product is also from Australia -- new Mask-It Masking Film, from X-Press It Graph X. This film is perfect for those of you who frequently airbrush and want a high-quality mask that will last over and over again. Mask-It is a clear, medium-tack adhesive-backed film that is easy to cut, and easy to apply. It works great on cardstock and is perfect for protecting areas of your work that you want masked during airbrushing. One really nice point is that you can clean the surface between sprays, unlike using paper masks that get sticky from ink buildup. Best of all, since it's totally clear, you can be assured of accurate positioning every time! If you have never used a mask before while airbrushing, then this tutorial should be really useful. There are many types and kinds of masking films, friskets, and adhesives available, but for today's tutorial we are using Mask-It, medium tack film. 1. Start with a copy of your image stamped or photocopied onto scrap cardstock. Apply a small piece of clear film over the stamped image. Make sure there are no air bubbles under the film, as this will distort the final shape when you re-use the film. Note: test your Mask It to make sure it will not pull up the fibers of your paper. If it seems to be stronger than the paper, then gently touch the adhesive to your clothing before applying to the paper. This will make it less tacky. 2. 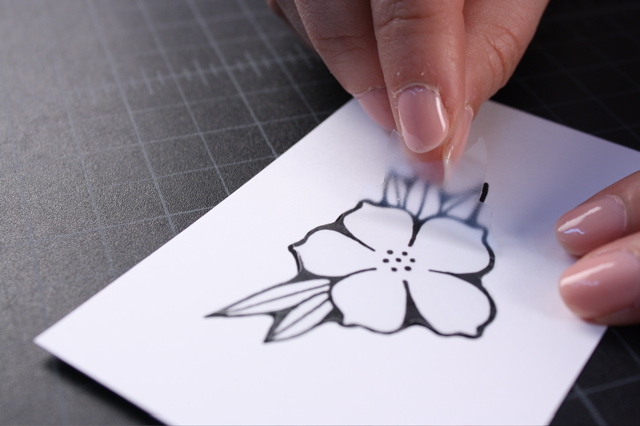 With sharp scissors, carefully cut around the scrap image. Save any pieces you will be using for masking. If you are airbrushing around a shape, save the inside, if you are airbrushing inside a shape and protecting the surroundings, then save the outside. You do not need to save the paper parts, just the clear Mask-It. 3. 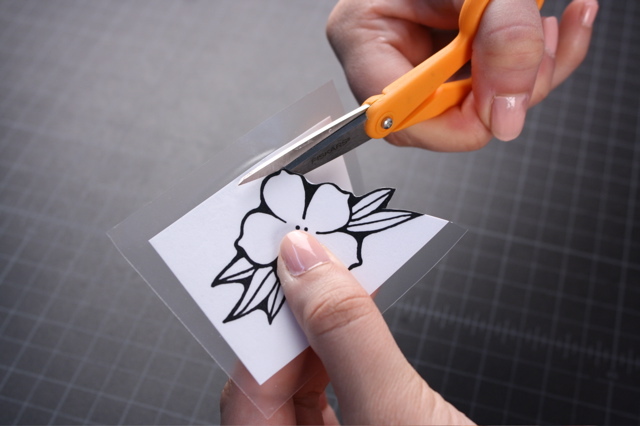 Apply the clear film to the area you want protected when you airbrush. This is tricky, since images with thin lines can shift easily, and you don't want to block any areas that should be airbrushed (it looks strange when you have an unintentional white halo around your art). Make sure that the film is smoothed down at the edges and won't move once you start blowing air. 4. Airbrush from the middle out. The medium tack film is great because even on fine detail areas it doesn't blow up around the edges, even if you've used the same mask a few times. 5. Carefully remove the frisket, and you're done! Save the used piece for your next project with that image. If you get a marker buildup, simply wipe the surface with hand-sanitizer. It will be technique based, and geared for those who want to color more professionally. We won't have time to work on altered arts and mixed media, rather, we will be discussing choosing colors, shadows, and how to color tricky things like faces and hair. More information will be available soon, so stay tuned. Please do not email us for applications or information, as the applications are not ready yet and it will be a different application process than in the past. Note: You cannot take the intermediate class without having taken the beginner certification, so sign up today for the regular classes! And just another reminder that I've updated my Copic Info page with new Copic Certification classes! I'll be back tomorrow or Monday with my own example of an image colored on the new X-Press It Blending Card! Wonderful stamps - would love to win! Congratulations on your Anniversary; you just keep getting better! Thank you for the wealth of information, tutorials, and inspiration...and of course, keep up the great work!!! We all love it!!! Congratulations, Jan! Please email me your mailing address, using the link under my photo and I'll get your stamps out to you! I'm busy making some artwork before I leave for the annual Craft & Hobby Show, so I'll be back the next few days showing you those. Then I'll run another Blogoversary giveaway over the weekend, so please check back for that! If you happen to be in Anaheim for the CHA's SuperShow on Friday & Saturday, I hope you'll stop by the Splitcoaststampers booth for some fabulous make & take projects from these wonderful companies. On Saturday from 2-4pm I'll be there with JustRite Stampers, along with Kellie Fortin (Market Development Manager), Debbie Olson & Dennis Thomas (National Sales Manager) and we'll have a great make & take project for you. You can see it HERE and I hope to see YOU there! (Above) Saturday night was SplitcoastStampers.com Cupcake Reception and the chance to meet up with several of my Dirty Dozen Design Team Alumni friends. From left: Debbie Olson (my roomate this trip! ), Jenn Balcer, Taylor VanBruggen, Lori Craig, Jami Sibley and me. These were most of the girls that came to visit me in November. Sunday, the first day of the show -- Jenn Balcer, Daven & Lori Craig from SplitcoastStampers.com got a hands-on tutorial at FLOWER SOFT -- a really neat product that I can't wait to try out! Debbie Olson demonstrating and teaching a make-and-take at the JustRite Stampers booth. She had the morning shift and I had afternoons. My sweet friends Joy (left) and Cami (right), together with their partner Kimberly at their absolutely adorable Our Craft Lounge booth. Sunday night dinner with the SplitcoastStampers.com Dirty Dozen Design Team (current & alumni) -- good times! Monday night dinner was provided so graciously by my friends Daisy & Joy from Eclectic Paperie. They had invited TIM HOLTZ (along with his entourage) sat at the table behind me! Me & Beth Silaika -- such a sweetheart. It was great to finally meet her in person, after cooresponding for a few years. Now I see how she keeps up with SIX children -- she is so energetic and bubbly! Most of the Copic design team -- From left: Me, Debbie Olson, Marianne Walker, Sherrie Siemens, Trudee Sauer. I know there are some more photos floating around that I wanted to share. When I find them, I'll add. I hope to be back with a project for you tomorrow and I'll definitely have a project for you on Monday! I got to watch Tim Holtz demonstrating these up close but was so enamored, I forgot to take a photo! I guess after my buddy, Lisa Strahl, filled an empty Copic marker with Alcohol Ink last summer, Ranger figured they should make their own markers! The markers are sold empty, so you can fill them with whatever Alcohol Inks you may already own. You can also custom mix your own colors or fill one with clear blender solution, for some really neat effects. Gives a LOT more possibilities, I think -- I can't wait to try this! I wasn't aware they also carry beads and fabulous vintage glass glitters <sigh>! I also got to meet owner, Barbara Trombley -- the self proclaimed original glitter queen! What lovely ladies she and her demonstrator were! Packaged in a nail-polish type of jar with a nib applicator. Primarily for paper but can also be used on just about any surface, with heat setting. The fine tips make it easy to color in very small areas. Very cool! Some of my favorite bling, rhinestones & pearls -- KAISER CRAFT'S booth is always full of beautiful projects and immaculate in white . . . everthing! It really makes all the gorgeous colors pop. Their make-and-take project is always wonderful, with a mile long wait, but my friend Lori and I made it by first thing one morning. I'll be back with photos of some friends I had a chance to spend time with! Magical Wishes (above, left -- fabulous for babies, little girls or Spring) & A Sweet Life (above, right -- will be wonderful for boys or Summer) -- gorgeous as always! Both new collections will integrate nicely with their existing line, as well, since a lot of the papers use some of these same colors in them. Below, left: Vellum Journaling Cards (new), 2008 mid-season releases Hello Beautiful & Old World Journaling Cards, along with Mini Calendar Journaling & Original Journaling Cards (lower shelf) -- I love these petite sizes of their wonderful patterns, packaged in clear CD cases! In fact, I have some and hopefully will have a new project with them soon to share with you. Webster's Magnetic Expressions are not a new product, but after being able to see them in person, I was better able to understand them. You can choose either a 9-inch or 13-inch square frame in different styles and colors, then choose a patterned magnetic background on which to display your 8-inch or 12-inch scrapbook pages or artwork. Lots of different options for displaying -- magnets or ready-made photo frames. Great concept -- I think some of these will be headed my way soon! Each new collection will have coordinating STAMPS, buttons, brads (regular & glazed), chipboard stickers & alphas, rub-ons & greeting card kits. My favorites were Wisteria & Porcelain. I'll be back with some more new product releases . . . These will be available in Tim Holtz's Distress colors (and not as sparkly as regular Stickles) as well as Suze Weinberg's Glitz colors. More later! . . . . Here are photos of some new releases of papers at CHA-Summer. This is just a small sampling of what I got to see -- there were a lot of booths I just never made it to! But I thought those of you who share my paper passion (including my friend, Stanna!) -- I knew you'd love seeing these!. I was very pleased to see FIVE new paper collections from one of my favorite manufacturers, BasicGrey. I can't wait to play with these (click on any of these photos for a larger view)! Another of my favorite manufacturers, Websters Pages, has two new collections (drool)! I loved the "paint chip" samples they had and was honored to get to meet Brandin O'Neill, whom I've had the pleasure of chatting with at their new online community, inspireMe (waving to Brandin!) They have some chat forums there, along with a fabulous gallery using their products. Jenni Bowlin has some cute new 4-inch chipboard alterable books, along with 4-inch scaled down patterned paper collections to use with them -- pure genius! That just about wraps up the papers I was able to see and take photos of. I'll be back with some more reports a little bit later! Licensed exclusively by Cornish Heritage Farms! I adore vintage Santas, so I loved CHF's first choices to release. Two new Dazzle (shimmer) COLORS of Versamark -- Champagne (gold) and Frost (pearl). Ohhh, the possibilities! Testing a post from my BlackBerry tonight because I'm unexpectedly without Internet service -- ugh! I'm leaving in the morning for CHA in Chicago and hope to bring you some reports, if this works out! That bowl of beautiful Rainier cherries you're hopefully seeing somewhere on this post are one of my favorite fruits of the season and my dessert tonight! OMGoodness, you don't know how much I was bouncing in my chair when this design came together, as it had been in my head for a while and I love when things work out exactly how I imagined! 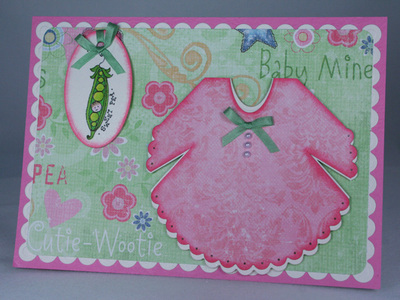 I created this sample for the Spellbinders booth at Feb '08 CHA-Winter. This sweet little baby dress was created entirely from Spellbinders dies -- the dress from patterned paper, using the largest of the large set of Nestabilities Petite Scalloped Circles. I cut the circle from patterned paper and then trimmed away the V's on each side to create the sleeves of the dress and the shoulders. The neck was cut away by using the new Nestabilities Classic Petite Ovals (smallest of the small set). All edges were inked. A duplicate dress was cut from white shimmer cardstock and positioned slightly off-center underneath the dress, to give the look of a petticoat. The dress is finished by piercing holes in all the scallops, a tiny light green silk bow & flat-backed light pink pearls. It is popped up on the cardfront. Overall card size is 5" x 7". The white scalloped layer on the card base was made with the largest of the large set of Nestabilities Scalloped Rectangles, cut & pieced around the edges of the pink card base. Edges of the patterned paper were rounded. I have more ideas on how to use this little baby dress and I can't wait to show them to you! So how do you like it? Spellbinders dies: Nestabilities Petite Scalloped Circles, Petite Classic Ovals, Classic Scalloped Rectangles & Tags 5 (for Sweet Pea). 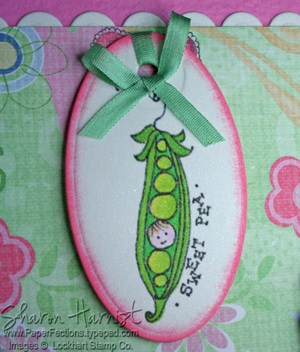 Stamps: Sweet Pea in a Pod by Lockhart Stamp Co. Paper: Sweet Pea patterned paper (Emma & Brenna designs) by Fancy Pants, Razzleberry Light Prismatics & Cryogen White Iridescent by Prism. Ink: Brilliance Graphite Black by Tsukineko, Copic Sketch markers, Worn Lipstick Distress Ink by Tim Holtz for Ranger. Accessories: Flat-backed light pink pearls from EllenHutson.com, light green silk ribbon (unknown source), sponge, Pop-Up Glue Dots, paper piercing tool by Making Memories. Check back tomorrow, when it's time for another of Beate's Weekend Sketch Challenges!